There are already international conventions prohibiting biological weapons, chemical weapons, land mines and cluster munitions, but no comparable treaty – as yet – for nuclear weapons. The international community must address this legal anomaly. 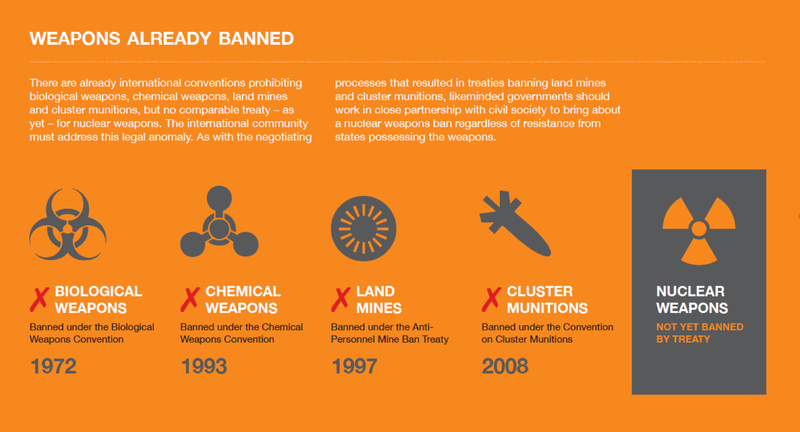 As with the negotiating processes that resulted in treaties banning land mines and cluster munitions, likeminded governments should work in close partnership with civil society to bring about a nuclear weapons ban regardless of resistance from states possessing the weapons. See Also: The Cluster Munition Coalition, an international civil society campaign working to eradicate cluster munitions, prevent further casualties from these weapons and put an end to the suffering they cause. For more on this subject see Humanitarian Disarmament.